The purpose of this study is to provide the academic basis asanalyzing the research trends in advertising and public relationsin Korea. The suggestion and trend of advertising and public relationsstudies with the results are as followed. Above all, academic research inadvertising in Korea has been growing remarkably in terms of quality aswell as quantity over the last two decades. Also, academic research in PRin Korea has been active despite its short history as a field of academicresearch. The growth of the PR industry and demand for PR services inthe public sector and corporates in Korea has also contributed to the rapiddevelopment of the discipline. Korea has experienced significant economic development and growth over the last three decades and currently enjoys being placed between the tenth and thirteenth largest economies in the world. Accordingly, it has also been enjoying significant growth in advertising and marketing services. Currently, it holds the twelfth position in terms of advertising expenditures in the world. The top five advertising agencies in Korea are Cheill Communication, Innocean, HS Ad, TBWA, and Daehong Communication, where annual billings range from $50 million to $100 million. There are several academic associations related to advertising and PR studies such as the Korea Advertising Society (KAS), Korean Association for Advertising and Public Relations (KAAPR), Korean Academic Society for Public Relations (KASPR), Korean Society for Journalism and Communication Studies (KSJCS), and Korean Marketing Association (KMA). The membership ranges from approximately 300 to 2,000 members, mostly from academia and in part from industry. In addition, most of the major colleges offer advertising and public relations (PR), communications, and marketing as majors, which are very popular choices among students. As a consequence, academic research in advertising and PR has been actively conducted in Korea since the 1980s, resulting in four to five major academic journals being published on a quarterly basis (or eight issues a year). The purpose of this paper is to examine the academic research trends of advertising and PR in Korea by reviewing previous studies that have analyzed academic research articles in these areas and that have been published in Korean academic journals such as Advertising Research (AR), Korean Journal of Advertising (KJA), Korean Journal of Advertising and PR (KJAPR), and the Korean Journal of Consumer Research (KJCR), as well as papers published by Korean scholars in international academic journals such as the Journal of Advertising (JA), Journal of Advertising Research (JAR), Journal of Current Issues and Research (JCIR), and International Journal of Advertising (IJA). AR, the first academic journal in advertising/marketing, was launched in 1988 by Korea Broadcast Advertising Corp. (KOBACO) followed by KJA, published by KAS in 1990. Both these journals are considered as quality academic journals for advertising and marketing research in Korea. Han (2008) has analyzed 817 research papers published in AR, from its first issue (1988) through its eightieth issue (2008), based on the following categories: research topics, periods, research methods and statistical techniques, characteristics of authors, and references cited. In addition, he analyzed these research papers in terms of four five-year periods, starting from the journal’s publication in 1988. Twenty issues of the journal were published per period. The number of papers published in the journal showed a deceasing trend from 227 in the first period to 187 in the fourth period because of more rigid review processes and the publication of new journals such as KJA and KJAPR in 1990. During the four periods, research issues in advertising and consumer behavior were the most extensively researched topics (119, 14.6%) followed by topics such as advertising media (92, 11.3%), advertising effects (78, 9.5%), creativity in advertising (63, 7.7%), and advertising industry (61, 7.5%). The five topics mentioned above accounted for 407 (49.8%) of the topics in research papers published during the four periods. As is evident from the numbers, issues in advertising and consumer behavior have been the most popular research topics in Korea for the past 20 years. In the first period, this area accounted for 18.1% of research topics; however, this decreased to 14.0%, 11.0%, and 14.4%, respectively, in the next three periods. Han (2008) explains the reason why issues in consumer behavior is a popular research topic in Korea: Most of the researchers were educated and trained in the U.S. for their doctoral degrees and on returning to Korea published articles from their dissertations and follow-up studies based on theories and methods that they had learned during their doctoral studies in the U.S. In fact, issues in consumer behavior have been extensively studied in marketing and advertising in the U.S. during the eighties and nineties, and the numbers shown above demonstrate similar research trends in Korea. The second most popular research topic is the issues involved with media, which has gradually increased from 14 papers (6.2%) published in the first period to 23 (10.4%), 26 (14.3%), and 29 (15.5%), respectively, in the next three periods. According to Han (2008), the introduction of new media such as cable TV, the Internet, IPTV, and DMB during these periods in Korea had spurred research interests in advertising media. He added that the economic depression and the regulations imposed on Korea by the International Monetary Fund (IMF) also contributed to the increased research interest in advertising media because it pushed advertisers and marketers to focus more on the efficiency of media planning. The effect of advertising is one of the most critical and popular issues in advertising and marketing research, more so in the second period with 42 (19.0%) papers being published. Research interest in the advertising industry has been consistent throughout the four periods with 61 (17.5%) papers being published. This was the result of AR publishing special issues related to topics in the advertising industry and the growth of advertising agencies and related services in Korea. The other research topics that attracted most attention from Korean researchers included social, economic, and cultural issues in advertising (58, 7.1%); special topics in advertising (51, 6.2%) such as public service advertising, political advertising, corporate advertising, and product placement (PPL); advertising and marketing (48, 5.9%); advertising and marketing research (46, 5.6%); and advertising ethics and law (45, 5.5%). In comparison, research topics such as advertising strategy (32, 3.9%), advertising and communication (28, 3.4%), international advertising (28, 3.4%), and PR/events/sp (20, 2.4%) did not receive much attention. However, it is notable that the research interest in PR/events/sp sharply increased from four papers being published in the first period to twelve papers being published in the fourth period, reflecting the change in the trends in advertising media from mass media to alternative media and emphasizing the efficiency of advertising media. The research methods employed during the four periods are mostly represented by the survey method (241, 29.9%), which accounted for an increase from 42 papers (18.5%) in the first period to 61 (27.6%) in the second, 64 (35.2%) in the third, and 74 (39.8%) in the fourth period, respectively. The literature review method (230, 28.23%) has also been used frequently as a research tool, and is the most popular method used in the first period (130, 57.3%). However, its usage dramatically deceased after the second period to 17 (9.3%) in the third and 7 (3.8%) in the fourth period. The decreased use of the literature method stems from the fact that there is a shift in research orientation from non-empirical study in the early stages to empirical study in the later stages. In fact, the percentage of empirical studies in the first period accounted for 30.8% (70); however, this increased to 55.2% in the second, 85.2% in the third, and 92.6% in the fourth period, respectively. In particular, in the fourth period, only seven papers published in the journal used non-empirical research methods. Accordingly, the use of experimental studies became popular, accounting for 21.6% (176) during the four periods. Specifically, 65 papers were published in the journal in the fourth period followed by 43 papers in the third and 39 papers in the second period, respectively. The method of testing the relationships between variables is expected to remain the same in the future, considering the trend demonstrated in the last two decades. The method of content analysis was also used appropriately, accounting for approximately 10% throughout the four periods. In the third period, it was fairly extensively used, accounting for 19.8%. During the four periods reviewed, 527 (64.0%) research papers employed statistical analysis methods as analytical tools, and basic analytical statistics such as analysis variance and frequency analysis were more frequently used than advanced statistical analysis. Specifically, an analysis of variance was the main analytical method used (148, 18.1%), followed by frequency analysis (85, 10.4%), regression analysis (74, 9.1%), structural equation model (SEM) (60, 7.3%), factor analysis (53, 6.5%), t-tests (40, 4.9%), chi-square tests (31, 3.8%), canonical correlation (13, 1.6%), cluster analysis (11, 1.3%), discriminant analysis(9, 0.9%), and multi-dimensional analysis (2,0.2%). It is notable that the use of SEM sharply increased to 19.8% (37) in the fourth period from 3.1% (7) in the first period. Han (2008) noted that the widespread availability of computer programs such as AMOS as well as the power of statistical interpretation of SEM contributed to the popularity of SEM in recent years. An analysis of variance (ANOVA) has been the most popular and persistent statistical analysis method throughout the four periods, and the use of factor analysis and regression analysis has also been increasing from the first period. On the other hand, the use of chi-square tests has been decreasing, resulting in only one paper using it as a statistical analysis tool. The researchers were mainly specialized in advertising/communication and marketing. Specifically, authors from advertising/communication accounted for (329, 40.3%) followed by marketing (112, 13.7%). Cho and Kim (2007) have analyzed the authorship of AR from 1988 through 2006 and found that the authorships from academia ranged from 65% to 87.0% throughout the periods while that from industry have been fluctuating from 37% to 29% in a decreasing fashion. According to this analysis, the references cited in the studies were mostly taken from Korean, English, French, and Japanese literature. The references most frequently cited were taken from English literature and accounted for 80.7% in the early periods, and decreased slightly to 72.8% in the later periods. In comparison, references cited from Korean literature accounted for only 17.5% in the early stages; however, this has increased to 29.5% in recent years. Other than the two resources, citations from other literature were very limited (4.1% ̴ 0.1%). The average number of citations per paper published in the journal increased to 32.7 in English and 12.2 in Korean literature respectively, from its early stages (13.7 in English and 3.0 in Korean). It is interesting to note that the most popular English journals cited include the Journal of Consumer Research (13.2%) followed by Journal of Advertising Research(8.7%), Journal of Marketing Research (8.0%), and Journal of Advertising (5.3%). Other journals cited included the Journal of Personality and Social Psychology, Advances in Consumer Research, Journal of Academy of the Marketing Science, Journalism & Mass Communication Quarterly, and Journal of Business Research. The KJA is an official journal published by the Korean Advertising Society, which is equivalent to the American Advertising Association (AAA) in the U.S. Lee (2010) has analyzed research papers published in the journal from its first issue in 1990 through 2009, based on the following categories: authorships (co-authorship, number of co-authors, affiliation of authors, etc. ), research topics, and references cited. The total number of authors that published papers during this period was 1,327, in 788 publications, averaging 1.7 papers published per person. The average of co-authorships during the period accounted for 48.7%; however, this has steadily increased from around 20% in the early years to 70% in recent years. The affiliations of the first authors were mostly from academia (76.2%) and the rest from industry (23.8%). Most of the authors specialized in advertising/communication (54.8%) and marketing/business (25.5%), while the rest specialized in diverse fields such as psychology, literature, visual design, and economics. Research topics of papers published in the KJA included the issues in advertising media (21.8%); followed by advertising management (18.8%); consumer behavior (15.6%); messages (15.2%); and social issues, economics, and law (14.0%). The research methods employed were represented by surveys (30.3%) and experiments (30.5%) along with other methods such as literature review (23.1%), case analysis (8.9%), and content analysis (7.2%). The trends of research methods employed show that non-empirical methods such as literature review, content analysis, and case analysis were widely used during the early years as compared to the increased use of experimental methods from the middle of the nineties. The number of references cited in 788 papers was 26,855, averaging 34.1 references per paper. In the early years, the average number of references cited per paper was around 10; however, this gradually increased to 20 ̴ 30 references during the nineties and to 30 ̴ 40 references later on, maintaining an average of 35 references. Seventy percent of references cited in papers were from English literature mostly from the U.S. References from neighboring countries such as Japan and China were extremely limited. Yoon, Chung and Pyun (2008) have also analyzed 730 papers published in the AR (294 articles) and KJAR (436 articles) from 2000 to 2007 to investigate and compare the number of articles published each year, the specialty and affiliation of the first authors, the number of authors for each article, and the research topics of the articles in the two journals. The results showed that the major journals in Korea are highly similar in terms of the categories used in the analysis, such as authors and research topics. Specifically, the authors mainly specialized in advertising/ communication/PR (57.9%), business/economics (25.9%), and psychology (9.9%) in AR. KJA followed similar distributions patterns in terms of the author specialization: advertising/communication/PR (60.3%), business/ economics (17.4%), and psychology (8.9%). In terms of research topics, the issues in consumer behavior, messages/creativity, advertising media/new media, and advertising effects were the main research interests in both journals, which was also demonstrated in other analyses (Cho & Kim, 2007; Han, 2008; Lee, 2010). A qualitative approach to advertising research in Korea, as opposed to a quantitative approach, has been extremely limited. Hwang and Kang (2004) reviewed 757 research articles published from 1999 through 2003 in four journals from Korea (KJA, AR) and the U.S. (JA, JAR) to explore how a qualitative approach in advertising research has been employed as compared to a quantitative approach. As illustrated in Table 1, a qualitative approach in advertising research has been very limited in Korean journals as well as in international journals. It shows that on average only 6% of studies in Korea and the U.S. have employed this approach to advertising research. The qualitative approaches used in the Korean studies included in-depth interviews (21), focus group interviews (FGI) (5), participating observation (4), and ethnographic (2). Research conducted using a qualitative approach in Korea has focused on the issues in advertising history, law, thought, social issues, messages, while limited attention has been paid to issues involving consumer behavior, media, and management. On the other hand, researchers used a qualitative approach in internal journals that focused more on the issues involving consumer behavior and management. It is notable that JA published a special issue on ‘Consumer Culture’ in 2003 and contributed to the increase in qualitative research on consumer behavior in international journals. Korean researchers have also been active in publishing and presenting research articles in international journals and at conferences. They have participated in international academic communities as reviewers and members as well. For instance, 14 Korean researchers out of a total of 142 reviewers, served as paper reviewers in the 2008 AAA conference, and 18 papers out of total of 61 papers at the advertising session of the 2008 AEJMC conference were presented by Korean researchers (Choi, 2009). Choi (2009) conducted an extensive study analyzing research papers published by Koreans in international journals such as the Journal of Advertising (JA), Journal of Advertising Research (JAR), Journal of Current Issues and Research in Advertising (JCIRA), and International Journal of Advertising (IJA). According to the analysis, Koreans have published 133 papers (3.56%) from a total of 3,730 papers from the first issue through the issues published until 2009 as authors and co-authors. The most productive publishing media for Korean researchers were the following: the JCIRA, published 24 papers (6.1%) out of total of 391 papers followed by the IJA (4.9%, 34 out of 694), JA (4.8%, 47 out of 986), and JAR (1.7%, 28 out of 1,693). During the early years, the number of Korean authors who published articles in international journals was very limited. However, this number has steadily increased from the nineties, with Koreans publishing more than 15 papers every 5 years. They have been particularly productive after 2000, publishing 37 papers from 2000 through 2004 and 54 papers after 2005. It is interesting to note that the number of papers published in the JA and IJA, in particular, increased from 2005, while the number of papers published in the JAR decreased, with only six papers being published from 2005 to 2009. The average number of authors in a paper published in the above international journals in which Koreans have participated as authors and/or co-authors was 2.67 persons from 2005 to 2009. The number is compared with 1.99 persons per paper, which is the average number of authors for each paper during the period from 1996 through 2005, suggesting that the collaboration among Korean researchers is increasing for international publications. The authorships of Korean researchers showed that the first authorship is 86 cases (45.5%) followed by second authorship (62, 32.8%), suggesting that Korean researchers have been playing a major role in collaborative research. The analysis on collaboration works with Korean and international researchers indicates that there were no articles published by a single Korean author until 1984, and 99 articles (74.4%) were published by co-authorship of Korean and international researchers. Specifically, the percentage of co-authored articles with international researchers has decreased from 100% in the early years (1975~1984) to 74.1% in later years (2005~2009). Moreover, single authorship by Korean researchers emerged in the mid-1980s. This indicates that Korean researchers have gradually moved from working with international researchers to co-authoring with Koreans and by themselves to publish articles in international journals. The Korean researchers who published articles in international journals opted to conduct cross-cultural comparison studies, thereby publishing 22 articles in journals such as IJA (13 articles). The research topics mostly included comparative content analyses of advertisements in magazines, newspapers, on the radio, and on TV in Korea, the U.S., Japan, China, and other countries. The cross-cultural studies between Korea and the U.S., in particular, have become popular resulting in the publication of 12 research articles through 2009. Specifically, the topics included international advertising strategies, perception of advertising ethics by practitioners, impulsive buying as a result of TV advertising, effects of advertising, effects of celebrity advertising, and motivation and perceived interactivity by Internet users. Thirteen studies that have exclusively focused on Korea include the quality of service of advertising agencies, classification of the TV audience, consumer responses on advertorials in magazines, credibility of advertising models, effects of involvement in newspaper articles and the size of advertisements on memory, conceptualization and measurement of integrated marketing communications (IMC) dimensions, effects of brand names and advertising copy on recall and cognition, and consumer evaluation of drama advertisements. Twenty-four out of 35 studies, which focused on cross-cultural studies and/or Korean culture, were conducted by co-authorships between Korean and global researchers from the U.S., Canada, England, Germany, Australia, New Zealand, Japan, China, Thailand, and India. The Internet as an advertising media has been a major research interest among Korean researchers who have published articles in international journals. In fact, 59 studies out of 133 research papers focus on the issues involved with advertising media and a half of the studies (28) are related to Internet media. Apart from the Internet, other forms of media include TV, newspapers, magazines, and the outdoors. In recent years, PPL in movies/dramas, DMB, and video games were also included as advertising media in studies conducted by Korean researchers in international journals. Research topics published by Koreans in international journals are categorized as follows: consumer studies (49 articles), advertising media (29 articles), creative issues in advertising (22 articles), advertising management (18 articles), and issues involved with advertisement agencies (5 articles). Issues in consumer studies including consumer awareness, perception, motivation, attitudes, purchasing intentions, and behavior, which were the most popular research topics, followed by advertising media, which included issues such as the selection and management of effective adverting media. Creativity issues in advertising mainly focused on the effective execution of advertising copy, the size of advertisements, copy, and context effects. The management of advertising studies explored the issues in IMC, advertising expenditures, sponsorship, and promotion. Special interest was paid to the issues in advertising agencies in terms of relationships between advertising agencies and their clients. Other topics included ethical issues in advertising (3 articles), ethnicity and advertising (5 articles), health and non-smoking, direct-to-consumer (DTC), celebrity models, and super-bowl advertising. The ranks of professorship held by Korean researchers, who have published articles in international journals, are compared with the findings of the previous analyses (e.g., Barry, 1990; Ford & Merchant, 2008; Henthorne, LaTour & Lorass 1998; Soley & Reid, 1983). These findings suggest that there are no significant discrepancies between ranks across publications. However, Choi (2009) found that assistant professors and graduate students dominate the publishing of research papers by Korean authors in international journals. The specialty and affiliations of Korean authors are journalism/communication (53%) followed by business (29.9%). This is compared with the findings of the Ford and Merchant (2009) analysis, which suggests that faculty members associated with business school are dominant research forces (64.1%). Research in PR in Korea has been actively conducted despite its short history as a field of academic research. The JPRR was launched in 1997 as a quarterly journal. Jo (2008) conducted a comprehensive review of 148 research articles published in the journal from its first issue. He suggested that research in PR in Korea has been rather confounding in terms of its identity as a science and less so in terms of theories and methods employed. Nevertheless, there has been an increase in the number of papers published in this field. A good example of this confusion among Korean PR researchers is the fact that the term ‘PR’ and ‘publicity’ is used interchangeably. He analyzed 148 articles published in the journal based on several categories such as research topics, research methods, statistical analysis used, and references. According to the results, research design in PR studies in Korea has been rather less rigorous. Only 21 studies (14.4%) out of 148 studies stated research hypotheses and most of these studies were from Master thesis and Ph.D. dissertations. Studies that were published without a research angle accounted for 54.4% of the studies, most of which were classified as company reports and case analyses. Contrary to research in advertising, a qualitative approach has been popular in PR research in Korea, accounting for 44.2% (65 studies); however, this trend has been decreasing in recent years. In particular, quantitative research sharply increased to 72.9% from 2004. The qualitative approaches used for the studies included case analysis (44.1%), literature review (38.2%), and interviews (17.6%). The survey method was the most popular tool in quantitative studies accounting for 70.4% (57 studies), in a sample size of 200–400 respondents. The average number of references cited per study was 31 references, an increase from less than 10 references in the early years. The references cited were taken from research articles, reference books, and conference papers. It is notable that most of the references were taken from English literature, limiting from sources from Korean and other languages. Jo (2008) also classified research studies based on their orientation, i.e., whether they were introspective or extrospective. The introspective research was very limited (19.0%) as compared to extrospective research (81.0%), which focused on practical and managerial issues (86.6%), rather than on theoretical backgrounds. The practical and managerial studies included mostly issues in public organizations (41.3%, 43 studies), followed by corporate PR (33.7%, 35 studies), and non-profit organizations (3.8%, 4 studies). Studies on public organizations are balanced in terms of policy and product PR, while studies on corporate organizations are more focused on issues of corporate image. Studies that used keywords and concepts such as image, brand, and reputation were very limited (5%, 4 studies) until 2001; however, this subsequently increased to 24.9% (19 studies), suggesting that the trend is positive in that it incorporates theoretical studies and corporate issues. In addition, it indicates a negative implication of research, following social trends without new and fresh ideas (Jo, 2008). Kwon and Lee (2007) conducted an author co-citation analysis to provide the academic basis and intellectual structure of PR studies in Korea. They analyzed 159 studies published across seven journals (Korean Journal of Journalism and Communication Studies, Advertising Research, Korean Journal of Advertising, Communication Theories, Journal of Public Relations Research, Korean Journal of Advertising and Public Relations, Journal of Communication and Information) from 2001 through 2005. The journals represent official academic organizations related to communication, advertising, and PR in Korean. After a review and analysis based on four criteria: status (year, journal, etc. ); methods; topics; and subjects, 159 articles were selected for analysis. The average number of citations was 12.9 per paper and the number of authors/co-authors was 2,084. After two stages of reviewing and examinations, Kwon and Lee (2007) finally selected 20 scholars/researchers who had been cited extensively in related studies. They also used multi-dimensional scaling and factor analysis to investigate the distance and relationships among researchers. As reported in Table 2, PR articles have been published mostly in JPRR, which specializes in the publication of PR research, followed by KJR. Moreover, the number of articles on PR has been increasing. Among 20 scholars selected, the top five authors/co-authors who have published the most for five years from 2001 through 2005 included Kim, Young-Wook (12), Park, Jong-Min (11), Shin, Ho-Chang (10), Cha, Hee-Won (8) Lee, Soo-Bum (7), and Han, Eun-Kyung (7). Authors/co-authors who have published more than 5 articles are 20 in number and account for 7% of the total articles published, suggesting that academic research in PR in Korea has been widely distributed in terms of authorship. As seen in Table 3, issues in PR campaign have been most frequently researched during the periods mentioned, followed by introspective research focusing on issues in PR phenomenon in specific areas. It is notable that introspective research in PR accounted for 22 %, while studies in PR campaign accounted for 60% in the previous analysis that analyzed PR articles from 1972 through 2002. However, the fact that introspective research has gradually been increasing in Korea indicates a significant change in PR research. Table 4 shows a cross-classification of research topics by research methods in PR studies in Korea, presenting the dominant use of the survey method in PR campaign and introspective studies. The content analysis method was also extensively employed as a tool in PR campaign studies, while literature review was the main research tool in introspective studies. In-depth interviews, case studies, and experiments were used on a limited basis in PR studies, depending on the nature of studies as demonstrated by the extensive use of in-depth interviews in PR campaign studies and case studies in introspective studies. It is rather surprising that no research in PR theories has used experiments during the five-year period, suggesting the lack of theory-testing studies in PR. 1. The launch of AR and KJA, two major journals in advertising and marketing, has contributed to the growth and development of research activities and the quality and quantity of advertising in Korea. For instance, a study by Han (2008) that has analyzed articles published in AR in terms of four five-year periods for 20 years (1998-2008), shows that of the 817 articles published during this period, 227 articles were published during the first period, which decreased to 187 articles in the fourth period. This tendency is evidently because of the introduction of more systematic and rigid review processes to enhance the quality of articles. The quantity of articles published in AR has decreased to an extent; however, the launch of KJA and KJAPR in 1990 served as additional mediums for the publication of articles, contributing to the increase in the quantity of research studies published in advertising. 2. Major research topics in advertising research included issues in consumer behavior, advertising media, advertising management, creativity, and messages, as demonstrated in review studies (Cho & Kim, 2007; Han, 2008; Lee, 2010; Yoon, Chung & Pyun, 2008). Recent years have witnessed increased research interests in new media/tools such as the Internet, cable TV, IPTV, mobile/smart media, PPL, and events. 3. Research methods employed in advertising research were dominated by empirical approaches such as survey and experimental methods, although literature review, content analysis, and case analysis, were also used frequently during the early years. Consequently, statistical analysis tools such as analysis of variance, regression analysis, and frequency analysis were heavily employed, followed by factor analysis, chi-square tests, cluster analysis, and structural equation modeling (SEM). The use of SEM has increased extensively in recent years. Qualitative approaches in advertising research have been very limited as demonstrated by a study by Hwang and Kang (2004), which showed that only 6% (15 articles) of 369 articles employed qualitative methods. 4. Most authors in advertising research are specialists in advertising, communication, and marketing. The average number of articles published per author was 1.7 (Lee, 2010, articles published during 1990–2009 in KJA). The number of co-authorships increased from 20% in the early years to 70% in recent years. Seventy percent of the references cited were from English literature (e.g., the U.S), as compared to 20% from Korean literature. Consequently, references from the literature of neighboring countries, such as Japan and China, were extremely limited. The average number of references cited was approximately 30 in number, and JCR and JA were the most popular sources for these citations. 5. Koreans conducting research in advertising have been active and productive in international academic communities as authors, presenters, and reviewers, even though the number and affiliations of participants are limited. The number of publications by Korean author(s) in international journals such as JA, JAR, JCIRA, and IJA is 113 and accounted for 3.56% during 1980 through 2009 (Choi, 2009). These numbers have steadily increased from the early 90s, and collaborations with other Korean researchers as well as with international researchers have also increased, as is evident from the number of the first authorships by Koreans (45%). However, most of the authors publishing articles in international journals are affiliated with U.S. colleges and organizations and work there as assistant professors and graduate students/assistants. Cross-cultural comparative studies and studies that focus on Korea are the major topics of interest among Korean researchers publishing articles in international journals. The above findings indicate that the trends in advertising research in Korea over the last two decades have been characterized by the growth and development of a research tradition that is oriented towards a quantitative approach to issues in consumer behavior, advertising media/management, and creativity/messages. This has been analyzed using statistical analysis methods such as ANOVA, regression analysis, SEM, and canonical correlations. Research activities by Korean researchers and scholars have also been recognized by international academic communities, particularly from the early 90s, and demonstrated by publications in journals and presentations at conferences. This can be attributed to the fact that most of the active and productive Korean researchers were trained and educated in U.S. educational institutions, and their knowledge and orientation towards advertising research has extensively influenced advertising research trends in general. Accordingly, the findings suggest that more research is needed using non-quantitative approaches, from various perspectives, to enhance the levels of knowledge and development of theories in advertising in Korea. In particular, the review processes for submitted papers need to be conducted in a more systematic manner, and rigorous standards set by qualified experts to enhance and control the quality of articles. It is also notable that an English journal (Journal of Advertising and Promotion Research) was launched by KAS in 2012 to promote the exchange of knowledge by Korean researchers on a global scale. The first issue published five articles: “New development for measuring return on investment (ROI) for Internet advertising: Building toward a ‘Brand Scorecard’ approach (Charles R. Taylor & C. Luck Brown),” “Country image effects of offshore-outsourced services and their implications for international marketers (Francis M. Ulgado & Moonkyu Lee),” and “The impact of brand information disclosure on consumer responses (Jang Ho Moon & Wei-Na Lee),”among others. 1. Research in PR in Korea has been less rigorous in terms of research design, method, statistical analysis used, and references cited. This has been particularly evident in early years with the increase in the publication of papers without a research angle, such as company reports and case analyses. Research in PR in Korea has been rather confounding in terms of its identity as a science and less so in terms of the theories and methods employed. An example of this confusion among Korean PR researchers is the fact that the term ‘PR’ and ‘publicity’ is used interchangeably. Moreover, the expansion of JPRR in Korean is still Journal of Publicity Studies. 2. A switch from a qualitative approach in the early years to a quantitative research approach in the later years is evident. 3. The average number of references cited per study has been increasing from less than 10 references in the early years to 31 references in the later years, mostly taken from English literature. 4. The research topics included practical and managerial issues in PR, such as issues in public organizations, corporate PR, non-profit organizations, and PR campaigns. It has been observed that studies in theory development and testing have been rather limited in PR research (Jo, 2008; Kwon & Lee, 2007). As stated previously, the discipline and industry of PR in Korea has progressed rather rapidly over the last few decades, and the activities of academic research, accordingly, have produced a significant outcome in recent years. Moreover, the number of Korean PR scholars who have been educated and trained in U.S. educational institutions is on the rise, and their research activities have been recognized in the international as well as domestic communities. However, for the future of PR research in Korea, theory-driven research is needed based on well-designed research frameworks to develop and test theories in PR from various theoretical perspectives. 1.Cho, E. S. & Kim S. N. (2007). A citation and author analysis of Advertising Research. Advertising Research, 74(1), 215-248. 2.Choi, J. (2009). Publication productivity and topic trends of Korean authors in advertising research. Korean Journal of Advertising, 20(6), 7-31. 3.Choi, J. (2011). A content analysis of the Korean Journal of Advertising and Public Relations, 1999-2010. Journal of Advertising and Public Relations, 13(1), 105-137. 4.Han, S. P. (1998). Content analysis of Advertising Research from 1988-to 2008. Advertising Research, 41(4), 71-93. 5.Han, S. P. (2002). Trends in international advertising research: Content analysis of major advertising journals from 1960 to 2000. Advertising Research, 55(2), 157-181. 6.Han, S. P. (2008). Trends in international advertising research: Content analysis of major advertising journals from 1960 to 2005. Korean Journal of Advertising, 19(4), 89-102. 7.Hwang, J. S. & Kang T. C. (2004). The current state and the vision of the adoption of qualitative approach in advertising research. Korean Journal of Advertising, 15(4), 33-52. 8.Jo, J. Y. (2008). A study of Journal of Public Relations Research: A metaanalysis of its first 10 years. Korean Journal of Public Relations Research. 12(2), 5-43. 9.Kwon, Y. S. & Lee, S. B. (2007). 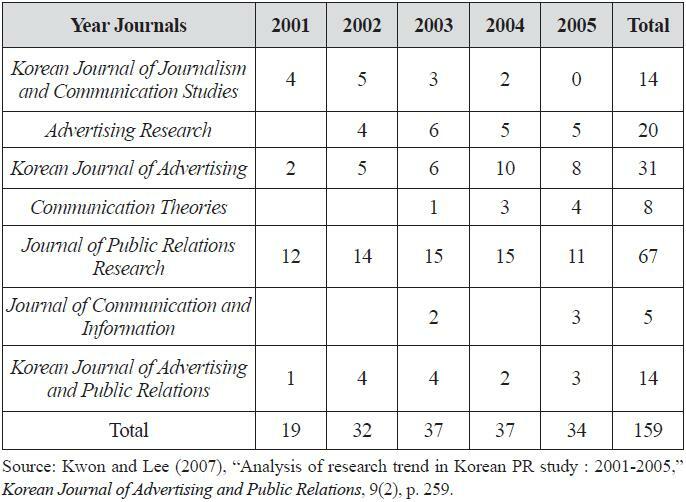 Analysis of research trend in Korean PR study: 2001-2005. Korean Journal of Advertising and Public Relations, 9(2), 244-276. 10.Lee. S. (2000). Ten years of the Korean Journal of Advertising: A content analysis of its first 10- year issues from 1990 to 1999. Korean Journal of Advertising, 11(3), 165-179. 11.Lee. S. (2010). Twenty years of the Korean Journal of Advertising: Content analysis of its first 20 years. Korean Journal of Advertising. 21(1), 241-258. 12.Yoon, K., Chung, H. K. & Pyun, S. H. (2008). A content analysis of the articles published in the Advertising Research and the Korean Journal of Advertising between 2000 and 2007. Korean Journal of Advertising, 19(4), 185-198. 13.Barry, T. E. (1990). Publication productivity in the three leading U.S. advertising journals: Inaugural issues through 1988. Journal of Academy of Marketing Science, 23(4), 182-194. 14.Ford, J. B., & Merchant, A. (2008). A ten-year retrospective of advertising research productivity: 1997-2006. Journal of Advertising, 37(3), 69-94. 15.Henthorne, T. L., LaTour, M. S., & Lorass, T. (1998). Publication productivity in the three leading U.S. advertising journals: 1989 through 1996. Journal of Advertising, 27(2), 53-63. 16.Pasadeos, Y. (1985). A bibliometric study of advertising citations. Journal of Advertising, 14(4), 52-59. 17.Soley L. C., & Reid, L. N. (1983). Advertising article productivity of the U.S. academic community. Journalism Quarterly, 60(3), 454-469, 542. 18.Yale, L., & Gilly, M. C. (1988). Trends in advertising research: A look at the content of marketing-oriented journals from 1976~1985. Journal of Advertising, 17(1), 12-22.